Headquartered in Crewe, Radius was founded in 1990 by CEO Bill Holmes who still leads the business today and remains the largest shareholder. Radius acts as the key intermediary and service provider between major energy companies, energy retail networks and over 200,000 SME customers. Capitalising on its scale, integrated technology and telematics service platforms, Radius provides SMEs with significant purchasing power and customer service excellence. At the forefront of its industry’s digital innovation, Radius operates a proprietary customer-focused portal and reporting platform known as "Velocity". Radius has also entered the fast growth telematics market and offers insurance products to its growing customer base, as well as being a major provider of MasterCard payment solutions. 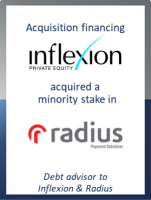 Phil Adams, Chief Executive at GCA Altium, said: "We are delighted to have advised Radius and Inflexion on such a large, high profile transaction. This is the second major deal we have announced in the last few weeks after the IPO of Footasylum and is a sign of the huge growth in our business in recent years particularly following our merger last year which has given us a truly global platform with 15 offices in 10 countries."